We shall look at the top 10 wall coverings and materials which are especially popular in modern home interiors. With the development of technology new materials and options complete traditional materials like wood, stone, paint and wall decoration ideas have become much more diverse. In the gallery below you will see magnificent examples of wall covering ideas and original interiors, exclusive designs, unusual and traditional materials and creative ideas. 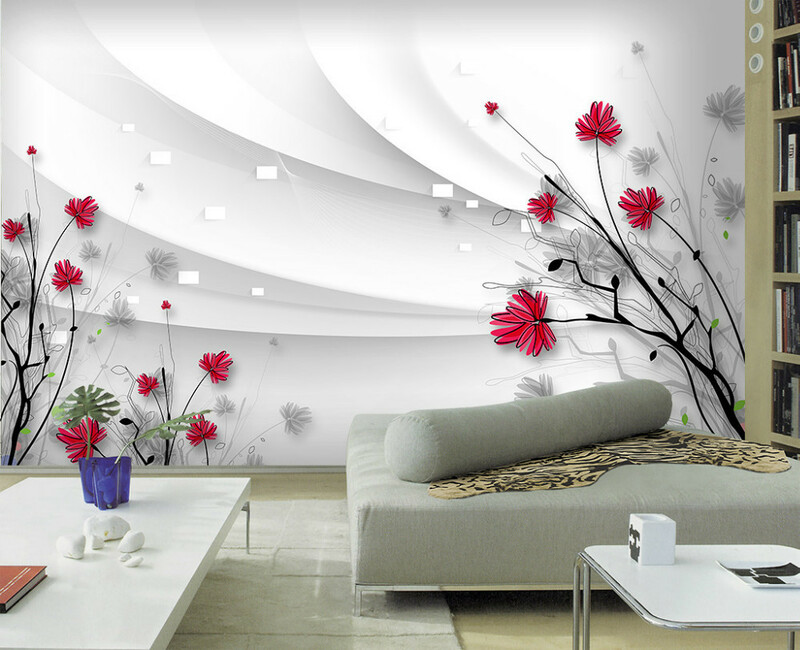 Decorating the walls is a key element in the interior. Trendy wall paint colors, murals, wallpaper – these have been used for many, many years. Today the world of interior design is full of new ideas and offers a new look of traditional wall coverings and a wide range of texture, colors and intricate patterns. Leather, stone, wood, ceramics, textiles, stone and mosaic – these wall covering materials are used back in ancient time and have not lost their popularity until today. Stone wall covering is one of the most traditional and original ways to decorate and transform the interior of your apartment or house. Decorative stone walls have a special appeal and modern stone wall coverings can be found in a wide variety of finishes. Whether you opt for natural stone or decorative faux stone you will benefit from the textures, shapes and colors. Stone wall covering is used in many design styles – rustic, country, modern, contemporary, Mediterranean, etc. Wood panels as wall coverings offer a practical solution with great visual appeal. Wood paneling is a great way to hide uneven wall surface and in addition wood wall panels have fantastic thermal and sound insulation properties. Wood is durable and eco-friendly and the market offers many varieties of wood wall panels from different wood species – pine, oak, walnut, birch, apple, and even exotic species. Further to the variety of wood wall covering ideas we have to mention the opportunities for using recycled wood, barn wood, pallet wood and those options are especially valued from fans of green designs and people concerned for Nature preservation. Decorative wooden wall panels give the interior an extraordinary appearance and show the taste, elegance and individuality of the home home. Wallpapers are considered to be the most popular wall covering. A wide range of different colors, patterns and textures can decorate any room. The variety of wallpaper types is really wide – vinyl wallpapers, textile wallpapers, grasscloth wallpaper, photo wallpapers, 3D wallpapers, etc. The design options are unlimited in terms of patters – geometric patterns, floral patterns, ornate patterns in various styles and due to the relatively low price, installation and maintenance wallpapers are used in almost any room of the home – living room, bedroom, even bathroom. Textile wall covering is an alternative to wallpaper and includes classic fabrics like silk and linen, but the market offers cotton, wool, burlap, etc. Fabric wall covering adds special warmth and comfort and have a long life span. Tufted wall panels from high quality materials look strikingly beautiful and are used in exclusive interiors which impress with sophistication and style. Cork wall covering is a fantastic option for the people who seek for natural materials. Cork wall tiles or cork panels are a modern alternative to traditional wall coverings. Cork wall tiles are offered in a number of styles, patterns and shades and will be a fantastic complement to the interior design. Cork is a beautiful accent and with many outstanding properties. Cork walls can be seen in living rooms, kids’ rooms, bathrooms and everywhere they look stunningly beautiful. Cork has great insulating properties, absorbs sound it is environmentally friendly and can be recycled. 3D wall panels are a new dimension in modern home decor. They give your walls a unique look and emphasize your individuality. 3D wall panels can be manufactured from various materials. Eco-friendly wood wall panels add the natural beauty of wood to fabulous designs with great aesthetic appeal. 3D glass panels are another option, but they have a high price tag and due to the heavy weight people tend to opt for other alternatives like PVC wall panels. PVC wall panels are a suitable wall covering for areas with high moisture level, as they are resistant to water, easy to clean and very durable. Leather wall covering is often seen in interiors that are designed to make a statement. Leather walls create a feeling of exclusivity, high end interior and works perfectly with natural wood, fur, as well as bronze and copper elements. Leather is soft, eco-friendly and durable. It is a breathable material, very warm and does not absorb odors. It has excellent noise insulating properties as well. Plaster is one of the oldest known wall coverings. Modern decorative plaster has a distinguished look, simplicity, efficiency and originality. Plaster can be used as a final finish on the walls or as an intermediary for another material before application. The material provides unlimited decorative solutions and creative wall decorating ideas. Once applied, it can be painted, you could apply a satin finish to a particular pattern or any other finish so that it suits your home interior. Brick wall covering is a characteristic feature of Industrial and loft interiors. Faux brick walls are widely popular as accent walls and you can see them in kitchens, living rooms and industrial bathroom designs. Bricks look fascinating and have many qualities which make them a popular choice for wall covering. Ceramic tile and mosaics wall coverings may sound like an unusual solution to many people especially if we talk about wall decorating ideas for living rooms or bedrooms. However, once you get out of the stereotype, you will find out amazing ideas and decorative wall designs which are a real eye catcher. Tiles and mosaics will last a lifetime and will require as little maintenance as a wet cloth. Enjoy the gallery below and the fantastic wall coverings! The Picture Pod is a one-stop-shop for everything you need to decorate your home. Located in Office No. 13, Union Properties Compound, Al Quoz. P.O. Box 7070. Dubai. UAE. Picturepod.me has a huge range of retail wallcovers from leading suppliers, such as; Jet Tex. The Picturepod.me online store has a wide selection of wallpapers, curtains and fabrics, and our friendly team are on hand to offer advice and guidance on the latest trends, colours, fabrics and applications to make your home decorating project easy. As well as huge stock lines of standard wallpaper, we also have a range of feature wallpapers to provide inspiration. Visitors to the Picturepod.me are assured of a welcoming experience and our experienced and knowledgeable customer support executives are on hand to help with difficult choices. In many DIY online stores it can be a case of blindly picking items online. Not so in the Picturepod.me, we maintain our position as the leading independent decorating centre in the Dubai, Abu Dhabi, Sharjah, RAK, UAE by not only carrying a wide ranging stock but by providing unbiased advice on how to use it. New products are continually being trialled and added to the range to reflect the changing face of the decorating market. We are based on ffice No. 13, Union Properties Compound, Al Quoz. P.O. Box 7070. Dubai. and have ample parking and easy access to the store to pick up your products. The Decorating Centre is open from 8am – 6pm on weekdays and 9am – 5pm on Saturdays, allowing retail customers to browse in a more leisurely fashion. For out of town customers there is a door to door delivery service covering entire UAE.